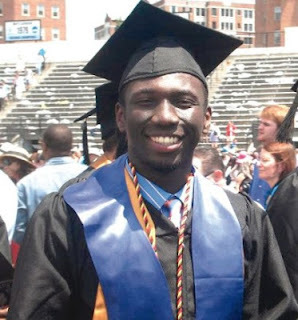 A 22-year-old Nigerian, Emmanuel Ohuabunwa, has made history at John Hopkins University, United States of America. Ohuabunwa from Arochukwu, Abia State, has done the nation proud by becoming the first black man to make a Grade Point Average of 3.98 out of 4.0 to bag a degree in Neurosciences in the university. He was also adjudged as having the highest honours during the graduation that was held on May 24 this year. For his efforts, he has won a scholarship to Yale University to pursue a degree in medicine. Besides, he has been inducted into Phi Beta Kappa Society, a prestigious honour group that features membership of 17 US Presidents, 37 US Supreme Court Justices, and 136 Nobel Prize winners. It was founded at The College of William and Mary on December 5, 1776, and thus it is the oldest honour society for the liberal arts and sciences and among the oldest undergraduate societies in the US. In an online interview with our correspondent, Ohuabunwa, who was born in Okota, Lagos and attended Lilly Fields Primary School, Lagos, said he left Nigeria after his junior secondary school education at Air Force Comprehensive School, Ibadan, Oyo State. “Some asked me if I lived in mud huts and ate faeces for breakfast. I remember one day, when I was walking to the school bus, a boy came from behind and punched me in the face, called me an African and walked away. It took everything in me not to retaliate. I knew that God had put me in the U.S for a purpose and it did not involve fighting or selling drugs or doing the wrong things. “My experience during that year gave me a thick skin. I learned to stand for what I thought was right even when the opposition seemed insurmountable. I also learned to look at the positive in all situations. Even though these kids were bullying me, I was still gaining an opportunity to school in America and nothing would stop me from making the best of this opportunity. “The shocker was that the kid that punched me in the face was black. I would have expected the blacks to be nicer to me. Nevertheless, I don’t blame those kids because they were ignorant about Africa. All they knew about us was the stuff they had watched on TV or documentaries, showing primitive African tribes, living in the jungle and making noises like monkeys. “In regards to the whites, there might have been some minor episodes but again I don’t blame them for it because it is a problem with stereotypes,” he said. “By the second year of high school, we were able to interact with doctors, nurses and other administrators in the hospital. The more I learned about medicine, the more it felt like the thing God was calling me to pursue and by being in the US I got a lot of people to support me to do this. Even though in high school, I got to see first-hand what it meant to be a doctor. We studied advanced anatomy and physiology, learned medical terminology, and learned important skills, such as checking blood pressure, pulse rate, and many more. Worried that his parents might not be able to sponsor him to the university, Ohuabunwa purposed to work very hard. He did and when the result of the PSAT came, he performed so well that he won the National Achievement Scholar. By virtue of this award, he received certificates of recognition from various organisations including senators from the Congress of both Texas and the US. He also received scholarship from the University of Houston; Rice University, Texas A&M Honors College and many more. He had also won the Principal’s Award during the annual awards ceremony at DeBakey High School. “During our graduation ceremony at DeBakey, I also won the Award for the Most Outstanding Senior Young Man and the student volunteer award for my volunteer activities in the State of Texas,” he said. But his breakthrough came when he won the Bill and Belinda Gates Foundation full scholarship to any university of his choice. He worked hard and gained admission to Johns Hopkins University to study Neurosciences. But why Neurosciences, Ohuabunwa said, “I studied Neuroscience, because I was fascinated with the brain, its control of our behaviours and how various diseases such as Alzheimer’s disease, lead to a decline in its activity. I also minored in Psychology because I wanted to understand disorders in the psyche. What causes bipolar disorders or schizophrenia. I did not just want to label them as crazy but to understand what causes these conditions and how we can treat them,’’ he explained. But what does he consider to be the missing links in the education sector of Nigeria when compared with that on offer in US, Ohuabunwa said unpredictable academic calendar, corruption, examination malpractice and inadequate funding were some of the problems confronting his home country’s university sector. These, he said, were absent in the US. Another difference, he said, is that America rewards hard-work while the system also emphasises on a balance between academic life and extracurricular activities. On how he won the scholarship to Yale, Ohuabunwa said his 3.98 GPA in Neurosciences, and many awards he had won and God’s grace, contributed to his winning the scholarship. “As at the time of my application for medical school, I had a 3.98 GPA of a 4.0. This made me the only black student inducted into the prestigious Phi Beta Kappa. I was also awarded the Becker Family Scholarship for being the most outstanding student in the Neuroscience major at Johns Hopkins University. Furthermore, by God’s grace, I took the MCAT and scored in the top five percentile. “That, combined with my hours of volunteer service in different hospitals across the US allowed me to gain acceptance into every medical school I applied to, including Harvard, Yale, Johns Hopkins, Columbia, and Cornell. As the time came to make a decision, I had narrowed it down to Harvard and Yale. Both schools, I enjoyed visiting. Nevertheless, while my parents prayed, they asked God to give us a sign of what school to attend. A few days later, I received a letter from Yale Medical School, offering me a full ride scholarship for all four years. That was the sign from God,” he said. But would he come back to Nigeria after the completion of his programme, he said yes. He added that his ambition is to become a medical doctor specialising in brain surgery. “Two weeks ago, my grandmother passed away after a long battle with strokes. Even during emergencies, it was difficult for her to get to the hospital, let alone get treatment. This is a common theme not only in the health care system of Nigeria, but in different countries in the world, where the poor get neglected. “Second, Nigerian hospitals lack the infrastructure required to compete with major hospitals around the world. It would be an honour to one day contribute to this transformation that is necessary for improvements in Nigeria’s health care sector,” he said. He, however, advised Nigerian youths who have the wherewithal, to go abroad to study. Ohuabunwa also called on wealthy Nigerians to invest more in the education of the poor rather than in acquisition of material things. Ohuabunwa, however, said that his parents, who he described as his greatest role models, contributed a lot to his academic feat through Godly training, counsel and guidance. He also did not forget the impact that his short stay at Air Force school had on him. “I was definitely not the brightest at Air Force. At that time, I felt like I spent more time running away from seniors than focusing on my studies. Nevertheless, I learned three things at Air Force that have served me well in the US. I learned discipline, adaptability and resilience. These attributes helped me a lot in US,” he said.